Valeria is an agronomist, KRI certified Kundalini Yoga Instructor (2011), and specializes in Pregnancy and Post Natal Kundalini Yoga (2011). 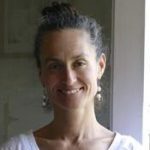 She is also a Doula and Vibrational Essence Practitioner (Bach Flower Remedies & others). Valeria teaches the Healthy Breast Program in SATYA and other areas in Santiago, Chile to educate, and support women in reducing their risk of breast cancer. In the fall of 2016 she will be teaching the Healthy Breast Program to women with breast cancer as part of a community health program in Bosque, a poor area in the south of Santiago.